Unusual sounds in your home are never good, no matter when or where they happen. Anything from a high-pitched screech (from a furnace) to a fluttering window shutter could mean trouble, and your plumbing system can make its fair share of weird noises as well. But it’s not always easy to decode what those sounds mean. Your plumbing system could be just settling down, or something could actually be wrong. Here are a few common plumbing sounds that you may hear. 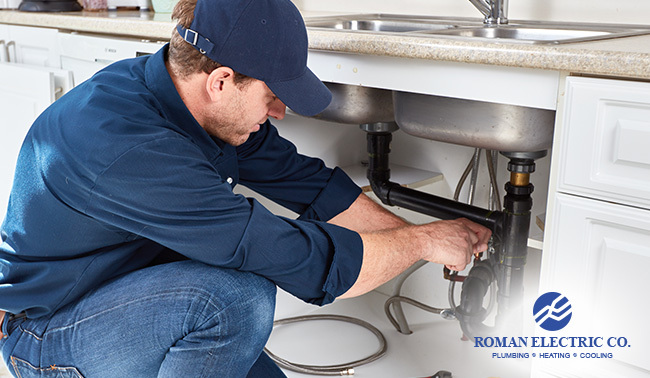 Let the plumbing pros at Roman Electric decode a them for you, and hopefully you’ll be able to tell whether or not you should call an expert to come fix a pressing issue – or whether you can afford to ignore them. A humming noise will usually come from somewhere in the walls. That’s because your pipes are vibrating thanks to higher-than-normal water pressure, and they’ve started vibrating under all the stress. Your water pressure should ideally be somewhere around 55 PSI, but it’s not always easy to test that yourself. The best course of action here is to call a professional plumber. They’ll calibrate your water pressure and return it to a much more manageable level, and the humming should go away. You’ll probably hear a rattling sound somewhere in the interior of the house, but it can happen anywhere that pipes are installed. This sound occurs when a securing mechanism is loose or becomes dislodged, leaving the pipe hanging loose when it should be tightly fastened. As the water travels through, it will jostle the pipe, leading to the rattling sound you’re hearing. If you’re hearing this noise, call a plumber to secure whatever has gotten loose. Since pipes are in hard-to-reach places, it’s a job better left to professionals. This sound happens when something is loose internally. Either a washer has gotten jarred out of place inside the faucet or pipe, or some other component isn’t secured like it should be. This is something you shouldn’t leave unattended for too long – eventually it may become a more serious issue, so call a plumber to fix the problem. Ideally, water should flow smoothly and easily out of your faucet and through your pipes. Sometimes, however, it doesn’t, and the flow gets blocked through some obstruction or another. The problem, though, is that a gurgling faucet flow isn’t always because of one thing. It can be a result of several different issues, but there’s no way to know without having a plumber inspect it. Instead of troubleshooting the problem and risking a bigger problem, let a trained expert handle it and take care of the gurgling. No matter what the situation is, Roman Electric can help solve your plumbing problems. Our trained technicians will identify and correct your problem, and they can answer any questions you may have about anything else going on with your plumbing system.